In stark comparison to my so-called career, C's doing quite nicely for herself at the moment. After a frustrating few years when she always seemed to be highly regarded but constantly passed over for jobs in favour of less able candidates, she's finally been getting a bit of recognition recently. The company has just been merged with another large retailer/wholesaler and has been taken off the stock market and is now in private ownership. As you might imagine, this has caused a certain amount of upheaval. The changes don't really affect me much, and actually I've been roped in to work on a large project related to the integration itself. C's position has been rather more fundamentally changed, with lines of management being completely redrawn and it looks like there's going to be further significant restructuring ahead. C's job is changing, but in spite of all of the uncertainty that brings, I get the sense that her stock has never been higher. After all, what's not to like? She's a very unusual beast in what is essentially a UK retailer because she speaks several languages fluently and is very good at everything she turns her hand to. As such, I think the new owners prize her, even if they have a rather funny way of showing it. Last night, C. and the executive team of her part of the business were taken out to dinner by their new boss. Not only does their new boss head up the sizeable international wholesale business of the company, but she also happens to be the long-term partner of the new owner and has a hefty personal stake in the company. I've never met the woman, but I've heard lots of whispers that she's not really much cop, that her part of the business is run terribly, but no one dares to say anything to her because of her relationship with the boss. If that's true, then it's a rubbish state of affairs. At dinner last night, apparently everyone was unsurprisingly falling over themselves to try and butter up their new boss and to make an impression... everyone, that is, apart from C, who didn't have the energy or the inclination because she's tired of being messed around and she's tired of the politics. At one point during the evening, in the middle of a conversation, the new boss lady stood up, walked across the room to the sofa where C. was sitting and began to stroke her hair. Not surprisingly, conversation dried up and people stopped to stare in slack-jawed amazement. C's response to this was to keep her composure and to say (in French - new boss is Italian and not very comfortable conversing in English) that she was going to stand up now as conversation was awkward between them with her sitting on such a low sofa. Nicely done, but there's no escaping from the fact that this was a very clear gesture by the new boss to everyone else present in the room, people who had been busy trying to impress her all night, that C. is the one she has picked out. Later on in the evening she was busy telling C. (perhaps a little wistfully) that she had done so well, considering she was "just a baby". 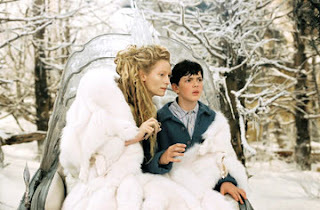 For some reason, I also now can't shake the image of the White Witch from "The Lion, The Witch and the Wardrobe" feeding Edmund Turkish Delight, as if he were some kind of pet. Mmmmm - interesting.Good for C.
Strangely enough, today I was looking at the terms of the loan note alternative to the sale of shares to XY Acquisition Ltd for a client - the whole deal has had a major effect on the finances of a lot of people in the Nottingham area. anyway, cricket is good isn't it. ...wonders what his boss would stroke as he has no hair...his tash maybe? urgh. Ah... Work politics. Ain't it great? I never bother with it myself, which is probably why I will never progress.